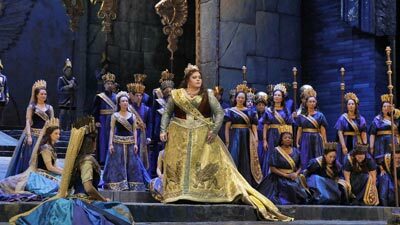 When John Copley’s opulent new production of Semiramide premiered in 1990, it marked the first time that Rossini’s grand drama had appeared on the Met stage in nearly a century. An operatic depiction of ancient Babylon and the mythic Queen Semiramis, the story includes many of the hallmarks of a legendary epic—valiant warriors, political intrigue, royal splendor, and the otherworldly presence of gods and spirits. Rossini’s stunning music matches the grandeur of the subject matter, presenting ample opportunities for dazzling vocal displays. 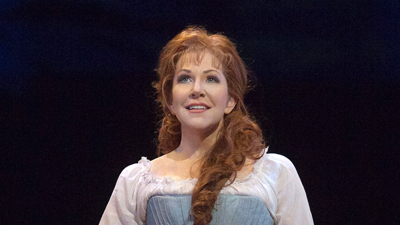 In the title role, American soprano June Anderson sings with both lustrous coloratura and affecting pathos as the conflicted monarch. Marilyn Horne, the leading Rossini mezzo-soprano of her generation, lends her rich, agile voice to another show stopping portrayal, as Arsace. Samuel Ramey is the menacing Assur, commanding the stage with his booming bass-baritone, while tenor Stanford Olsen, as the prince Idreno, stuns in his two ravishing arias. Maestro James Conlon leads the Met Orchestra and Chorus in a score that combines virtuosic singing with grand spectacle.